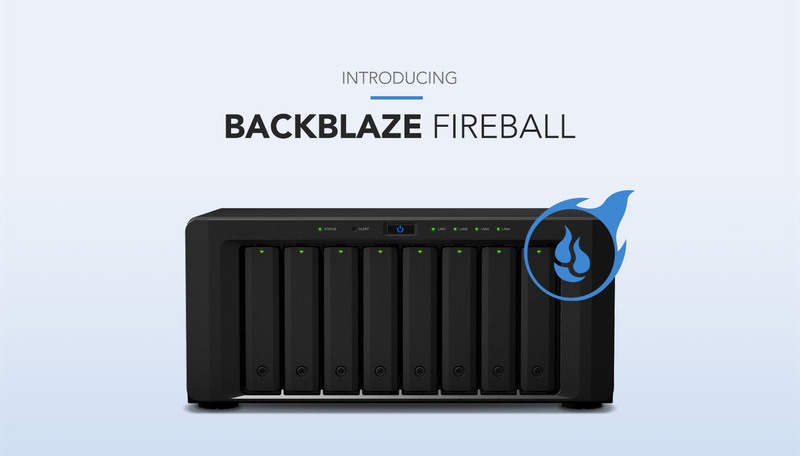 Backblaze’s rapid ingest service, Fireball, graduates out of public beta. Our device holds 70 terabytes of customer data and is perfect for migrating large data sets to B2 Cloud Storage. At Backblaze, we like to put ourselves in the customer’s shoes. Specifically, we ask questions like “how can we make cloud storage more useful?” There is a long list of things we can do to help — over the last few weeks, we’ve addressed some of them when we lowered the cost of downloading data to $0.01 / GB. Today, we are pleased to publicly release our rapid ingest service, Fireball. What is the Backblaze B2 Fireball? The Fireball is a hardware device, specifically a NAS device. Any Backblaze B2 customer can order it from inside their account. The Fireball device can hold up to 70 terabytes of data. Upon ordering, it ships from a Backblaze data center to you. When you receive it, you can transfer your data onto the Fireball using your internal network. Once your data transfer is complete, you send it back to a Backblaze data center. Finally, inside our secure data center, your data is uploaded from the Fireball to your account. Your data remains encrypted throughout the process. Step by step instructions can be found here. For most customers, transferring large quantities of data isn’t always simple. The need can arise as you migrate off of legacy systems (e.g. replacing LTO) or simply on a project basis (e.g. transferring video shot in the field to the cloud). An common approach is to upload your data via the internet to the cloud storage vendor of your choosing. While cloud storage vendors don’t charge for uploads, you have to pay your network provider for bandwidth. That’s assuming you are in a place where the bandwidth can be secured. Your data is stored in megabytes (“MB”) but your bandwidth is measured in megabits per second (“Mbps”). The difference? An 80 Mbps upload connection will transfer no more than 10 MB per second. That means, in your best case scenario, you might be able to upload 50 terabytes in 50 days, assuming you use nearly all of your upload bandwidth for the upload. If you’re looking to migrate old backups from LTO or even a large project, a 3 month lag time is not operationally viable. That’s why multiple cloud storage providers have introduced rapid ingest devices. Every vendor that offers a rapid ingest service only lets you upload to that vendor’s cloud. For example, you can’t use an Amazon Snowball to upload to Google Cloud Storage. This means that when considering a rapid ingest service, you are also making a decision on what cloud storage vendor to use. As such, one should consider not only the cost of the rapid ingest service, but also how much that vendor is going to charge you to store and download your data. *AWS does not estimate shipping fees at the time of the Snowball order. To make the comparison easier, let’s create a hypothetical case and compare the costs incurred in the first year. Assume you have 100 TB as an initial upload. But that’s just the initial upload. Over the course of the year, let’s consider a usage pattern where every month you add 5 TB, delete 2 TBs, and download 10 TBs. Just looking at the first year, Amazon is 337% more expensive than Backblaze and Google is 374% more expensive than Backblaze. Put simply, Backblaze offers the lowest cost, high performance cloud storage on the planet. During our public beta of the Fireball program we’ve had extremely positive feedback around how the Fireball enables customers to get their projects started in a time efficient and cost effective way. We hope you’ll give it a try! The post Introducing Backblaze’s Rapid Ingest Service: B2 Fireball appeared first on Backblaze Blog | Cloud Storage & Cloud Backup.